How can we lift millions out of poverty, create 600+ million jobs, reduce inequalities, protect the environment and grow the economy? This key challenge will be discussed in January 2019 by around 500 innovators and leaders from governments, civil society, private sector, development organizations, media and the general public at the Ministerial Conference of PAGE (Partnership for Action on Green Economy) in Cape Town, South Africa, and the Green Economy Coalition's Global Meeting that same week. SEED is convinced that small and medium enterprises (SMEs) are pivotal for tackling this key challenge. According to the World Bank, SMEs play a huge role in the private sector, particularly in emerging economies where formal SMEs alone contribute up to 60% of total employment and up to 40% of national income (GDP). The importance of SMEs is even higher when informal businesses are included. SMEs are already providing innovative solutions in response to local social, environmental and economic challenges. With innovative business cases, these eco-inclusive enterprises are already driving the inclusive and sustainable economy forward. At the same time, business models of eco-inclusive SMEs ensure that nobody is left behind in the green economy transition. Along their value chains, eco-inclusive SMEs create jobs for marginalised communities, deprived women or unemployed youth. 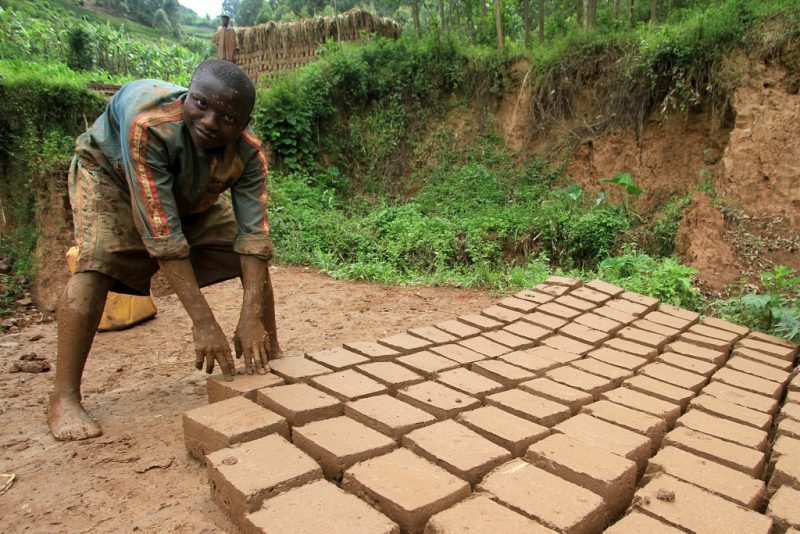 Through the provision of sustainably produced consumer goods and services, SMEs are not only averting environmental degradation but also widening the availability of affordable and sustainable products for the base of the pyramid (BoP, the largest and at the same time poorest economic group). 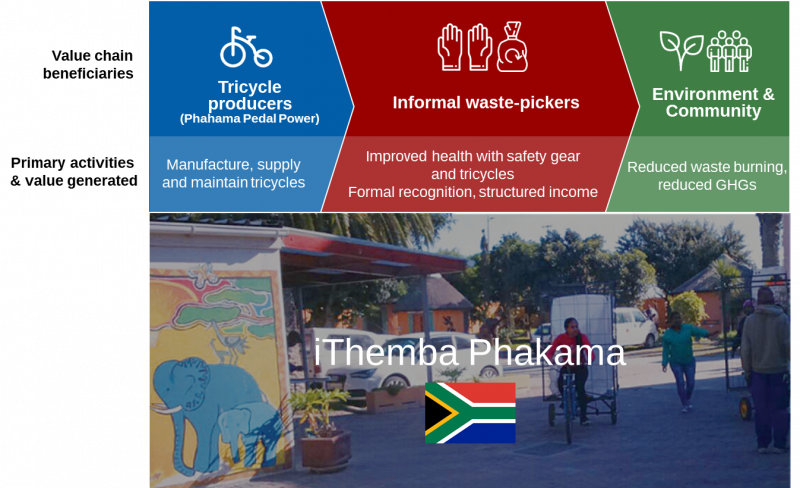 2017 SAG-SEED Award Winner iThemba Phakama provides informal waste pickers in the Greater Cape Flats Region with safety gear and robust, locally manufactured tricycles for transporting waste. The tricycles are used as an alternative to stolen shopping trolleys that many in the informal waste picking sector use illegally. The enterprise is financed through advertising space on the tricycles, and from members’ monthly contributions until they save enough to fund their own tricycle. iThemba Phakama creates a local waste sorting system, and enables waste-pickers to become individual micro-entrepreneurs who salvage recyclable waste, sell it to recycling centres and receive formal recognition of their work – reflected in increased income by as much as 400%. 2018 SEED Low Carbon Award Winner Khainza Energy provides safe, clean and affordable cooking fuel solutions to Ugandans. The enterprise turns organic waste obtained from farms and households into high-quality methane and sells these in recyclable cylinders along with cooking appliances. 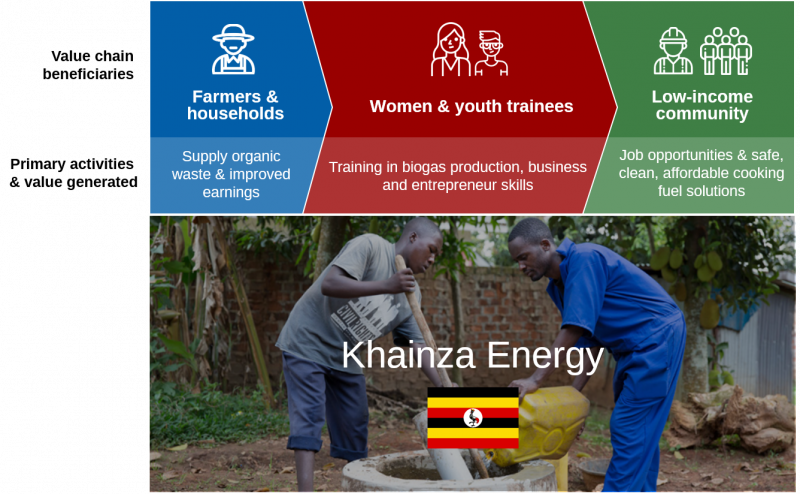 Khainza Energy incorporates local women, youth and farmers along its value chain and distribution channels. Female leadership in particular drives the business, with high-level positions such as the CFO and Marketing Executive held by women. In order to motivate more women towards entrepreneurship, skills courses are also tailored to train women and youth in biogas production, basic business and entrepreneurship skills to empower these target groups to launch their own SMEs. In addition, the SME has recruited 150 women as sales agents, and more than 63,000 female small-holder farmers benefit from using Khainza Energy’s products. Currently, 15 youths are undergoing training of skills in constructing biogas systems for rural households and farms - skills that will enable to launch their own biogas businesses and earn a sustainable livelihood. Exceptional candidates are also offered employment with the enterprise. Khainza Energy’s target is to train 90 youths in 2019. 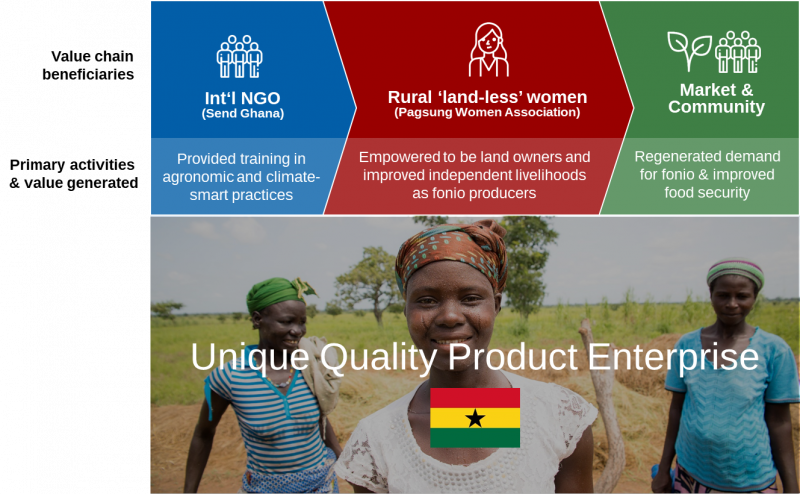 2016 SAG-SEED Award Winner Unique Quality Product Enterprise represents the first business in Ghana that adds value to fonio, a neglected, indigenous and nutritious cereal crop that grows well on unfertilised marginal land. The enterprise dries, de-husks, packages, stores and markets fonio cereal products. UQPE’s business model focuses on mobilising and supporting rural landless women - through their partner, the Pagsung Women Association - who were traditionally dependent on men. UQPE helps the women acquire land for fonio cultivation and buys the harvested grain at guaranteed prices, making women crucial players in the supply chain. They also provide fonio processing centres and help market the final products. With UQPE, 830 rural women farmers have benefited from fonio agriculture innovation and are now able to earn their own income independently. Being part of the fonio producing value chain, the women gain access to income and food as well as the ability to fulfil their social responsibilities like sending children to school and maintaining their family’s health. Besides fonio agriculture, the women farmers have also invested their income to raise goats to further diversify their income sources. Despite the tremendous contributions to green and inclusive economies, eco-inclusive SMEs such as iThemba Phakama, Khainza Energy and UQPE too often remain unseen champions which continue to face challenges to reach their full potential. As with every young start-up enterprise, but even more so for SMEs in developing and emerging countries the risk of business failure is high. Besides challenges such as access to financing or technology and a lack of adequate business management skills, the ecosystem in developing and emerging economies often additionally obstructs business development. The barriers are even more pronounced for eco-inclusive SMEs as they are pioneering new business models that challenge conventional perceptions of business. Eco-inclusive SMEs need recognition and the support of the international community to accelerate their businesses and multiply the number of value chain beneficiaries and contributors. Governments, development organizations and financial institutions need to ensure that tailored financial instruments are available to successfully close the early stage funding gap for SMEs. Policies and green economy strategies need to acknowledge the contributions of SMEs and actively work to multiply these. SEED works directly with aspiring SMEs to strategise, optimise and award achievements in eco-inclusive entrepreneurship, and also aims to build an ecosystem of supporters and advocators necessary to the success of growing enterprises. In preparation for the PAGE Ministerial Conference, SEED will host a dedicated session at the Green Economy Coalition’s Global Meeting 2019 on January 9th in Cape Town, South Africa to develop concrete ideas how decision makers can ensure that everyone gets a stake in the green economy transition. Can big agribusiness adapt to a green economy?